During the 2013 fall semester, Translation and Interpretation students in the TRIN371-Web Page Building course, offered by Erin Maloney (instructor in the Department of Banking and Finance), built web pages, as students in the course have done for the Bilkent community since 2005, when they first built a website for the School of Applied Languages. 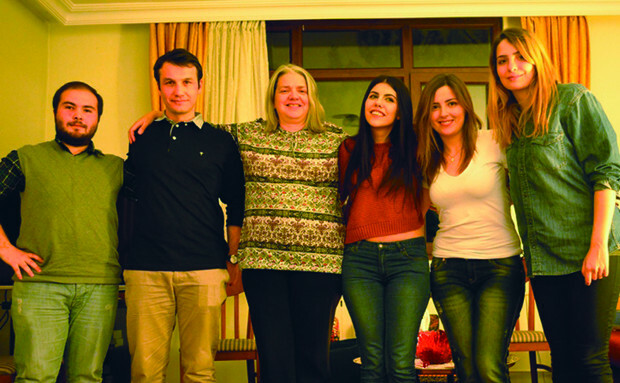 Simden Erler, Ceren Eteke, Akya Gönülal, Hande Şen and Burcu Uğuz, with guidance from Dr. Jennifer Reimer and Dr. Craig Ireland, rebuilt the website for the Department of American Culture and Literature (http://amer.bilkent.edu.tr). The website for the Department of Molecular Biology and Genetics was rebuilt under the guidance of Dr. Deniz Atasoy by Oğuzhan Demirok and H. Çınar Demir (http://www.fen.bilkent.edu.tr/~bilmbg). Participants in the project joined Ms. Maloney and her husband Dr. Jacques Morin (instructor in the Department of Archaeology) for the third annual WPWP (Web Page Wassail Party) on Friday, February 21.